I’ve been debating whether or not to choose a favourite image from the weddings I photographed in 2012. There were many to consider, ranging from images of the brides and grooms to all sorts of images of wedding guests in a variety of settings. Some that appealed to me greatly at the time have lessened their impact a little since then, and it’s been far from easy to pick just one image. So in the end I have fudged the issue somewhat and picked a closely related of images – as I rather liked the similarities and differences. 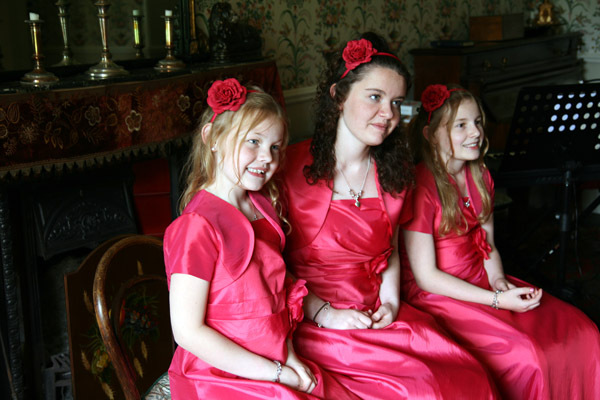 Here are two photographs of three bridesmaids from a wedding in June at the Old Rectory in Great Melton near Norwich. 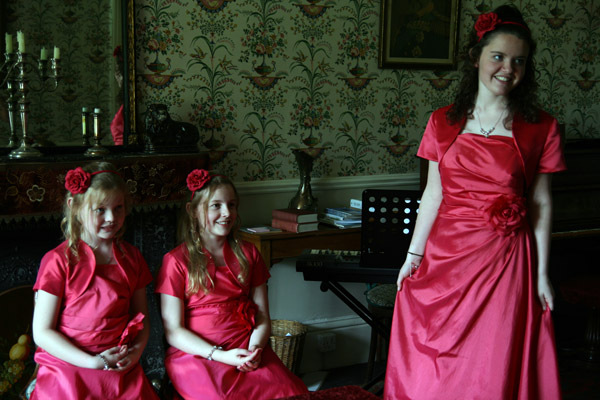 We had been wandering around the music room with a couple of other members of the family while the bride’s preparations were underway, and I was in the process of taking pictures of them wandering around the room exploring the musical instruments and generally relaxing and enjoying themselves. Some of the pictures I took in this room are among my favourites from the wedding (I find children often make the best subjects and they were no exception). In both pictures the girls are posing for someone else off camera to my right. In the first one, they aren’t fully settled in to their poses and still show fairly natural expressions – admittedly each one is different. In the second picture, taken a couple of minutes later, they are posing and their expressions are quite different. I prefer the first one – but taken together, they tell something of a story and I think they have much more meaning than if they had been looked at separately. Just a small point, maybe, but for me it’s an interesting one nonetheless and that why I have made these my favourites from 2012. This entry was tagged bridesmaid, documentary, Great Melton, Norfolk, Norwich, Old Rectory, photojournalist, reportage, wedding. Bookmark the permalink.